In honour of a great artist and a living legend, recording artist and producer Xyclone took to the studio and voiced an amazing tribute to one of Jamaica’s best, Spragga Benz, who is also became world-renowned for his acting debut in the hit Jamaican movie Shottas. The track is called “Top Shottas Anthem” on the Top Shottas Riddim and features former Gaza Empire member, Deva Bratt. It is on the new RSQTHP label, in collaboration with Black Out Squad and 3rd Floor Productions. It was released in September 2012. Xyclone looks up to Spragga for his lyrical versatility and talent to not only perform on stage but also to act in movies. “In my opinion, Spragga a di real Top Shotta so that’s why we [RSQTHP] built the riddim and named it Top Shottas Riddim,” said Xyclone. He also made it a point to mention that Spragga is a mentor to him as well as other young artists and ghetto youths. 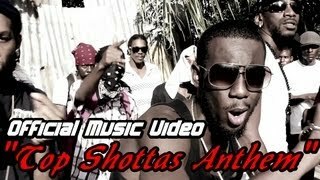 Already “Top Shottas Anthem” has gone over 8,000 views on YouTube. Also, with an impressive 20,000 plus views, Stylo G’s hit “Bolt” is another tribute to another living legend, Jamaican track superstar Usain Bolt, which has skyrocketed Top Shottas Riddim to an overwhelming anticipation for the release of the compilation. There are other popular artists who have jumped on board like D’Angel, Red Rat, Magazeen, Bawse Dawg, Delly Ranx, Esco, Ninja Kid, Ratigan and Brik Tears.